Bruce Dickinson's What Does This Button Do? 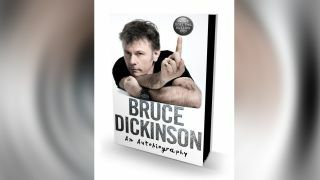 It will be published via Harper Collins on October 18, with Dickinson writing parts of his memoir across seven A4 notebooks while the band were on their world tour in support of latest album The Book Of Souls. A statement from the publisher reads: “A true polymath, Bruce is, or has been, an airline pilot and captain, an aviation entrepreneur, a beer brewer, motivational speaker, film scriptwriter, twice-published novelist, radio presenter, TV actor and a world-class fencer. The first print run of the UK hardback will feature black-sprayed edges. What Does This Button Do? is now available for pre-order. Dickinson and Iron Maiden recently announced they had teamed up once again with Robinsons Brewery to release another branded beer – a Belgian-style beer titled Hallowed. The Bruce Dickinson Quiz: how much do you know about Iron Maiden’s frontman?